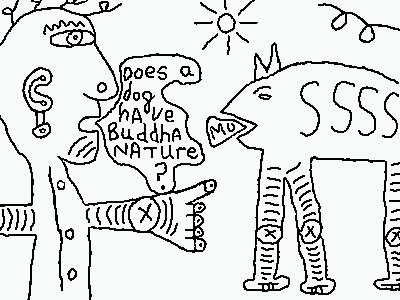 Q: Does a dog have Buddha nature? I asked my son whether he had a name for his new son, born today (5/16/09, 6:45 am). "No," he said. "How about the Japanese name for 'no,' 'mu,'? I asked. "No," he said. The Mu koan is as follows: A monk asked Zhaozhou, a Chinese Zen master (known as Jōshū in Japanese): "Has a dog Buddha-nature or not? ", Zhaozhou answered: "Wú" (in Japanese, Mu). Congratulations! Have you thought of naming your grandson for your relationship with him? Q Does a cow have a Buddha nature?